It’s not everyday we see cranes in Darien. On Monday there were two. One doing routine maintenance, it appeared, on the cell phone tower by Darien Police Headquarters, and the second in the parking lot of the Thorndal Circle Office Park. 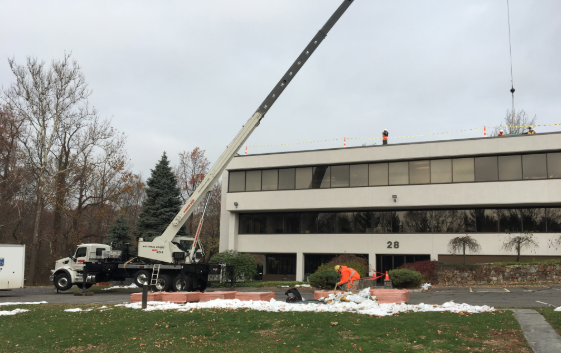 At Darien Library, there’s a statue of a heron, but at nearby Thorndal Circle and at Police Headquarters, they had some cranes on Monday. The later was lifting the parts and pieces of a solar panel installation to be placed atop 28 Thorndal Circle. 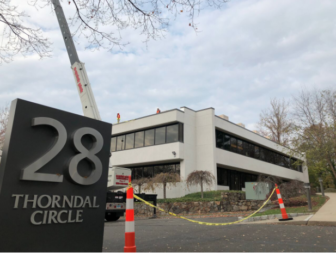 The installation by Stamford-based Peregrine Renewable Energy at 28 Thorndal will be the second by building owner Jerry Nielsen, who also recently installed solar panels atop 6 Thordal Circle, also with Peregrine. The two buildings are part of Thorndal Circle Office Park. Both have deployed solar with 100-percent financing from Greenworks Lending via the state’s C-PACE program, which allows for renewable and energy efficient building upgrades to be financed privately through a special tax assessment on commercial properties. Literally just beneath the ongoing installation is an interesting commercial tenant —Greenworks Lending itself. The Darien-based company is headquartered on the third floor of 28 Thorndal, and while operating nationally, has financed several renewable energy projects in Darien including 6 Thorndal, Mini of Fairfield County and 110 Boston Post Road, which is home to Post Modern Home and several additional businesses. From November through this February, Darien Police Officers are fundraising for The Leukemia & Lymphoma Society. Officers participating in the fundraiser are required to donate $50 for each month that they participate. The Darien Police Commission has authorized Police Chief Raymond Osborne to relax grooming standards during this period to allow male officers to grow neatly trimmed beards and female officers to wear earrings.